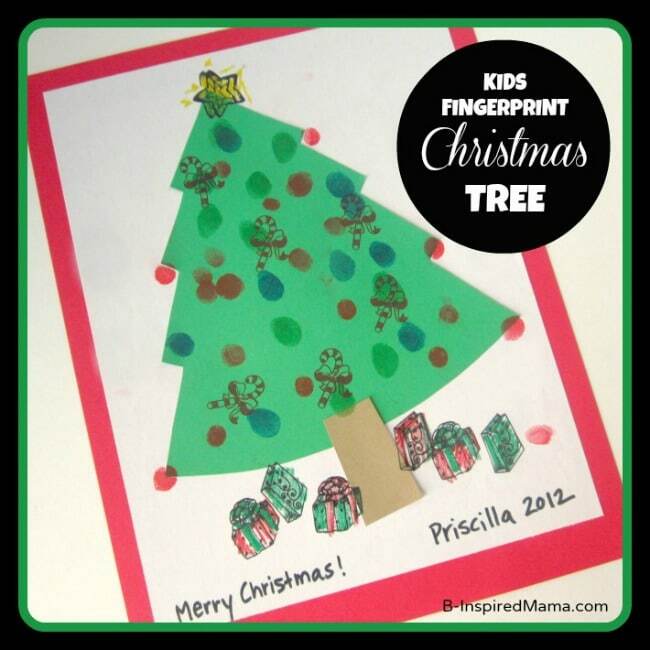 A Kids Christmas Craft with Cute Fingerprints! Fold the computer paper in half lengthwise, draw a half a Christmas tree shape on the folded edge, and cut out. Unfold the Christmas tree shape and use it as a stencil to trace the Christmas tree shape on the green paper. 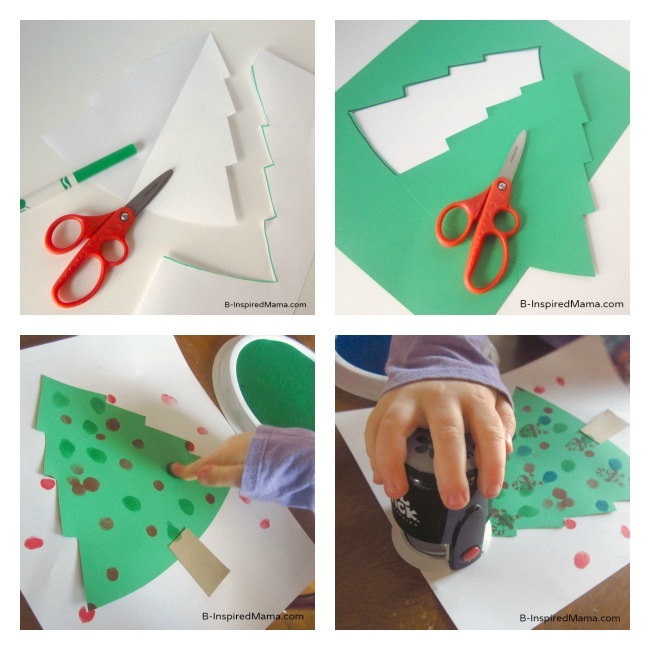 Cut out the Christmas tree shape from the green paper and glue it onto the white card stock. Cut out a small rectangle from the brown paper and glue down for a tree trunk. Print fingerprint ornaments onto the tree. Stamp candy canes and a star onto the tree. Stamp presents under the tree. Glue the white card stock onto the larger red paper to create a red frame. The kids could actually use any stamps or stickers to decorate their Christmas trees, but the PSA Essentials Peel & Stick Stamps made this such a quick and simple project. 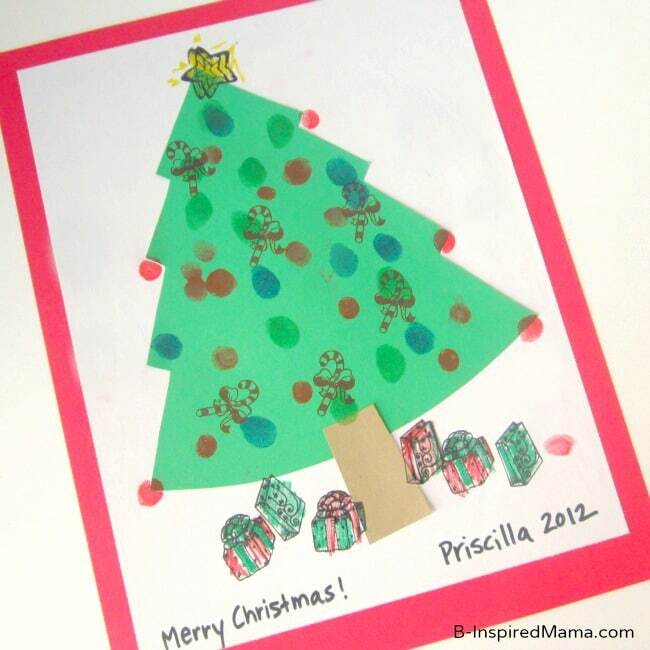 Have any ideas for creative kids Christmas crafts? I’d love to hear about them in the comments below! How fun ! Definitely going to add this to the list of Christmas crafts we will be doing this year. I’ve always been a sucker for fingerprint crafts, and I love how simple this is. Thanks for the idea. Love the fingerprint baubles. Adorable. Lovely tree. i love fingerprint art! it’s so personal! thanks for linking up to tip-toe thru tuesday!